Iteration #2, I created an upper and sole. Because the tutorial didn’t say whether to draw the foot outline with the pen vertical (and thus the line quite far outside my footprint) or with the pen as close as possible to where the foot actually touches the paper, I decided to try both. I began with an outline of my foot made with the pen vertical, because I knew it would result in the largest possible outline. If needed, I could trim it down later, rather than making a smaller one and having to make a second one to get a larger one if needed. Iteration #3: I corrected the foot outline, because it was still too large. 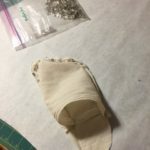 rather than pulling the upper inward and towards the edges of my sole, it let the upper fall straight down in a drape over the sides of my foot, and hang towards the ground. Iteration #4 I corrected the upper, because I finally felt that the sole was okay. Iteration #5 I sewed together the sole and upper, then sewed them both to the leg. Once I’d done so, I could tell that there were leg problems. 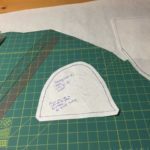 The curved, tunnel-like opening to which I sewed the upper was far too small and far too curved, so there was a LOT of gathering and puckering. Ditto at the heel, and there was no way I was going to let that much wrinkling go down into my shoe with me: I’d be hobbled by blisters within an hour, and have a miserable event. So, first, I left the heel attached while I unpinned the front curve from the upper, cut out some of the upper, and re-pinned it. It took a few teeny, thin cuts to get it right, but I eventually did do so. I also wound up with the two sticky-downy bits that flank the curve, coming a bit further forward on the foot. Instead of looking like an upside down U, the curve now looks sort of like someone sat on the U and pressed its legs outward a bit. Not in a bulging curve, but in a gentle slope. Then I repinned and reassessed. Outside edge of right foot sole attached to upper. This is from, I think, the first iteration. Inside edge view, elevated, of right foot upper and sole. Topside view of right foot upper and sole. I’ve just realized how huge this makes my foot look. Iteration #6 was when I fixed the heel. 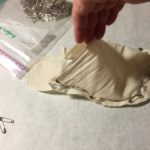 I had to unpin the heel and the lower 3-4 inches of the leg, adjust, and re-pin until the heel wrinkles disappeared. This shaved off quite a bit of territory vertically as well as horizontally. For Iteration #7, I slipped the stocking on and realized that it was extremely loose, even after accounting for the fact that it would have to slide off my leg at some point. 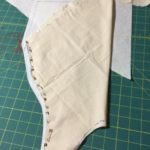 I sighed and got back to work with the pinning, unpinning, re-pinning, unpinning, ad nauseam, until I’d gone as far as I can. See, I can handle the pinning from the angle of looking at the inside of my leg. But there’s no way I can see and fix the outside of the leg, so even though it fit, there were severe wrinkles being pinned into the outside edge. At this point, I had to bother Hakim. Hakim does not want to sew. Hakim does not want to help with sewing. Hakim does not want to stand still so he can be measured or draped so someone else can sew for him. Hakim wants to say “I wear a size <whatever, I don’t even freaking now>, just make me whatever,” and have garb magically occur and magically fit him right. 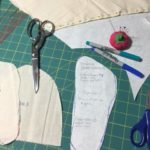 He is especially difficult when I’ve made him garb — remember, I haven’t touched a sewing machine in a little over a year because the thing is eeeee-ville and of the deh-ville, so everything I sew, including toiles/mock-ups, is by hand — and it’s not perfect. He wants it to be fixed, but doesn’t want to try it on so I can see where and how it needs to be fixed. So when I say, “Honey, can you help me a minute with these pins?” there is a long-suffering sigh as he agrees. “[siiiiiiiiiiiiiiiiiiiigh] All right.” And he takes his sweet time standing from the couch, saunters over to where I am, and then sighs some more as he learns that my leg and foot are all the way down there on the floor; that the foot is shaped differently when standing as opposed to when propped up on a table or a lap; that the light doesn’t actually reach the area where the feet are; that we don’t have a standing lamp with a flexible head/arm that can be pointed at the area; that he’s to blame because he won’t let me buy one; that I meant safety pins instead of straight pins, because they’re a pain to use; that no, he can’t use straight pins, because I need to pull the thing off my leg when he’s finished and would rather not be shredded by them. It was five minutes of re-pinning, preceded by at least five of kvetching and followed by a couple more minutes of sighing and complaining as he used the opportunity of standing, anyway, as a chance to get himself a cookie from the kitchen. Y’all. Normally he is the sweetest, most helpful, patient, enthusiastic person in the world. But when it comes to sewing, it’s a good thing he’s cute. Anyway, eventually he did re-pin the leg. Correctly. Or, at least, correctly enough that I could suss out what it was supposed to be. I gave up on him, and on Iteration #7, and sewed the thing up to give it another test. And now I have a stocking that fits the right leg. A muslin stocking — I’m going to have to pick out some linen to make the ‘real’ one — but it does fit. Also? It only took me four iterations to fit the left leg and foot. I’ve worked on this stocking pattern every day since Sunday, for several hours a day. I’ve sewn every toile by hand, because machines are evil and scary and super fast and I hate them. I’ve used up about 2.5 yards of muslin. And I have forgotten, throughout an incredibly high percentage of this time, that I own such a thing as a camera, and therefore there are very few pictures of the fitting process. Right foot upper, final pattern. Right foot sole, final pattern. 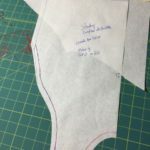 Right foot leg, last toile (ran out of muslin!). Right foot leg, final pattern. Right foot final pattern pieces. And do you want to know what the weird thing is? I’m severely lopsided, okay? I have a shoulder that’s an inch and a half higher than the other, one breast is a full cup size larger than the other, and one hip is nearly two inches lower than the other. I’m obligated to have a lopsided pattern for all non-stretchy clothing in my life. But my feet and lower legs? I can actually use the same pattern for both stockings, but reversed. 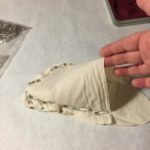 I only know that because when I was sewing this, I kept forgetting to switch it inside out and put it on the right foot. It does fit the right foot. But when I switch it inside out, it also fits the left food just as well. 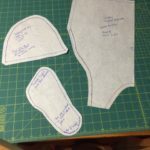 So, unlike everyone else in the Knowne World who can wear symmetrical body garments but has to have two different stocking patterns, I can actually get away with just one stocking pattern. YAY. Now I just need to actually sew a pair of stockings. I’ve been sitting here all day trying to pick which linen I want to use for my first pair. Because oh, hell no, they aren’t going to be cotton muslin. Encourage him , with cookies and otherwise! Oh, he didn’t. He got it squahawdy as all get-out. I had to zhuzh it up pretty seriously to get it usable.